New West Symphony works year round to bring music education into the lives of young people in our communities, from elementary school through college. Our programs are designed to inspire passion for music through interactive live performances and music education programs that enrich the lives of our young audience members. 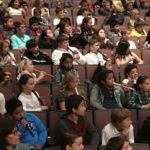 Symphonic Adventures – Nearly 5,000 third-through-fifth grade classes in Ventura County attend special interactive concerts performed by the professional musicians of the New West Symphony. 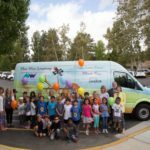 Music Van – A custom van with musical instruments, along with instructors, travel to classrooms and provide a hands on experience to engage students and get them interested in playing musical instruments. 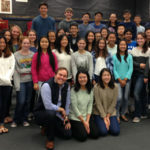 Laby Harmony Project of New West Symphony – The award winning Harmony Project provides instruments and lessons to underserved children in the community with proven results in academic performance. Low-cost concert tickets for students – Through our Connect! Club and VIP Family Club programs, students age 7-24 have an affordable opportunity to attend world-class classical music performances with the New West Symphony. Students also benefit from backstage visits with New West Symphony guest artists and musicians. Hear & Now Pre-Concert Talks – Before each concert is a 30-minute informative discussion, free to ticket holders, about the upcoming music selections, topical history and lives of the composers. Led by famed musicologist, David Ravetch, these entertaining talks enrich the concert experience for all concertgoers of any age! ‘Meet The Artist’ Talks – Each concert week New West Symphony hosts a 1-hour interview program with guests artists and guest conductors. This intimate question & answer program showcases each artists’ insights and background, and often includes a musical performance. Quick Bowman Piano Competition – Every year the New West Symphony holds a competition to give youth and young adult pianists an opportunity to perform before local judges, with prizes awarded for top performers in each age group. Created by Henry and LaReine Quick in 1990, the competition culminates in a recital with competition winners performing for the public.